The most optimum environment in which to test Royal Icing consistency is one that falls between 40 and 60 percent humidity. A low humidity will force you to add more water to your mixture. 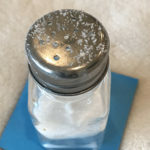 In high humidity, however, water vapor contained in the atmosphere is constantly being added to your mixture, making the mixture difficult to adjust even if you add more powdered sugar to sop it up. Ideally, home-baked sugar cookies are crisp and have a snap to them. As humidity increases, those cookies begin to taste moist and become flexible. Bread, cake, and pie also quickly degrade in high humidity, with bread turning moldy if not stored in a refrigerator. It takes skill to decorate Royal Icing sugar cookies and as a home baker, you do not want your entire batch ruined due to high humidity. 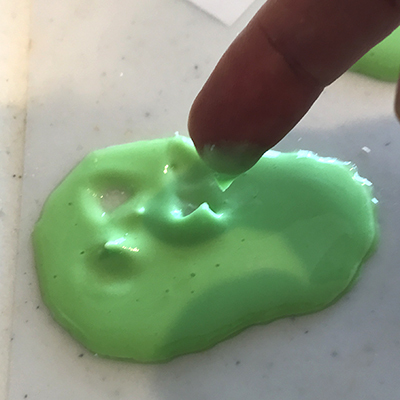 Whether practicing on plastic sheets or trying to make a batch for family and friends, high humidity can make Royal Icing “melt” and sugar cookies soggy. The example on the left side of the photo above is a closeup of a perfectly decorated cookie which was created and served in a normal humidity. On the right is the result of a consistency test that was created in an air-conditioned atmosphere. When I went to bed, I turned off our air conditioner, and opened windows, not thinking about how the Royal Icing would be affected. The humidity outside was a warm, 100% and when I work up, I found that the frosting itself flowed into a moist, sticky mess. Don’t let this happen to you! The last thing you want to do is see all your painstaking work melt away, so take care to regulate the humidity in your baking environment and make sure to refrigerate all your hard work in air-tight containers. Before attempting to test and ultimately use Royal Icing, make sure that the humidity in your home is between 40 and 60%. Check one or more rooms using inexpensive Room Humidity Monitors. The outside humidity is not as important if your home is sealed and you run an air conditioner. 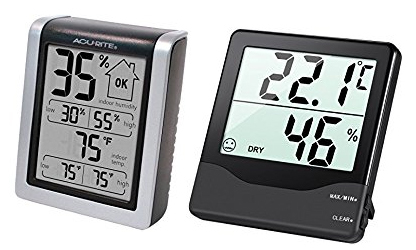 Use inexpensive temperature and humidity monitors to help you gauge your environment. Indoor humidity is variable from zone to zone, especially when someone is showering in one room and someone else is boiling soup in another. Aim for an even humidity throughout your environment on the day or days you get into sugar cookie baking and decorating. You can lower the humidity in your baking area by running a dehumidifier or air conditioner. If you can’t easily install a whole-home dehumidifier, perhaps a room-sized unit or two will do. 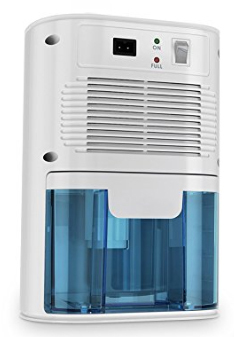 The Pure Enrichment Premium Dehumidifier, for example, is designed for very small spaces and might be all you need. But If You Can’t Lower Your Humidity . . . If you cannot control the humidity in your baking area at a normal level, postpone baking sugar cookies and working with Royal Icing. The key to a good taste in your final product is a crisp bite and pretty appearance which is difficult to achieved when humidity is very high. Refrigerate sugar cookies in an air-tight container before and after being frosted. If you plan on serving them as a centerpiece, consider the display atmosphere. Deliver them in an air-tight container layered with parchment paper. Let them sit out for a short-but-reasonable period. When dessert time is over, return them to the container (if any are left, of course). If you must serve your beautiful creations in a humid area (like at a summer picnic by a lake), be as careful with them as you would with egg salad. Keep them in a cool, air-tight container until service time, then put them away again shortly thereafter. Cookies frosted with Royal Icing are small works of art, so protect the looks and tastes of your creations as much as possible and do not waste time fighting with the atmosphere because high humidity will probably win.